Not to be confused with my June 17, 2013 post, Serbian Food, Belgrade Restaurants… It is nearly a year later and I can safely say that my thoughts about food at post remain unchanged: I love Serbian food. Although I don’t think I could eat ćevapi every day, I can happily eat it quite often, along with bacon-wrapped chicken, and a host of other meat-centric dishes. So if you’re a vegetarian, Serbia is probably not the best place for you — and I say that with deep regret, as much of the meat here is divine. They take their grilling seriously and one can never go wrong ordering a mixed meat plate. 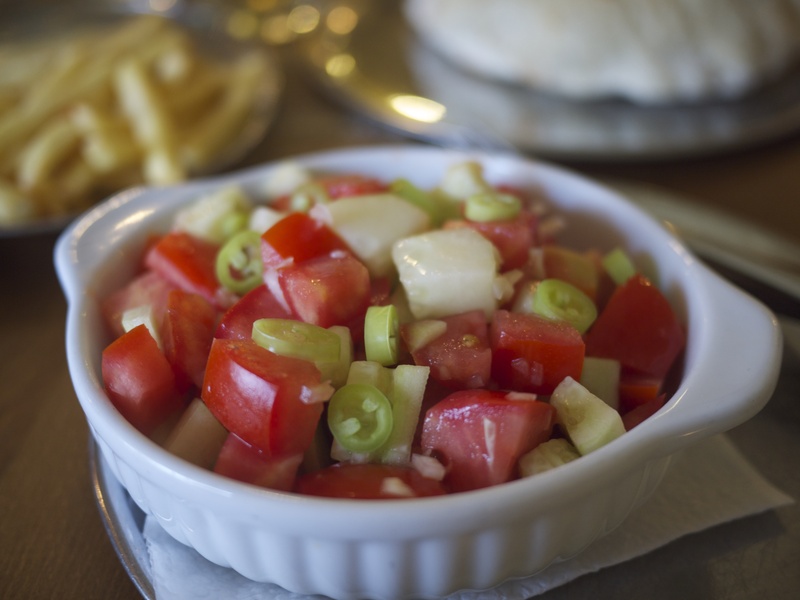 I still adore the šopska salad, although occasionally I order a srpska salad to share with Grant, which is basically the same mixture of cucumber, tomato, onion, and/or pepper, except without cheese. Now that summer is nearing, the salads are even better. I still can’t get over how inexpensive food is here, especially fruit and vegetables when they are in season. Right now, I’m eating tons of strawberries and cherries. Yum! When discussing Serbian food, one would be greatly remiss not to mention the breads and pastries. When my sister returns this summer, one of the first things she wants to do is have some bread (Walter’s ćevapi are next on the list). But the pastries really can’t be beat: plain, fruit, chocolate, meat, cheese, meat and cheese — they have it all, and at a very reasonable price, too. Something central to the Serbian diet (yet not found far from Serbia) is burek. Burek is a flaky, cheesy pastry that can be on the oily side (but not if you know where to get it! ), but will fill you up like nothing else. It may contain two times my suggested caloric intake, but it is deeelicious. 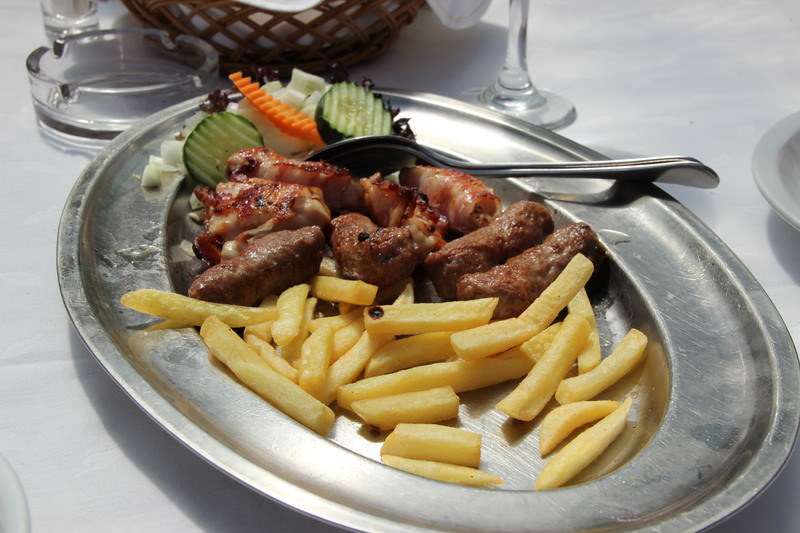 My main complaint with Serbian food is that there is a great lack of “lighter fare” dishes. As a person of relatively small stature, I am able to finish my meal only very rarely, even when ordering a half portion. Perhaps that is because the portions here are gigantic, but it doesn’t help that most of the food is very heavy. Hmm… chickpea burgers, interesting. Send the recipe over and I’ll try it sometime! Mmmmmm. Bacon-wrapped chicken? Where can I sign up? 🙂 We are a meat and vegetable centric (wheat-free) family, and Belgrade sounds delicious! Lol, your post reminded me of living in Serbia and discovering a ‘Karadjordjev’. My memory may be inaccurate, but I remember it as meat, wrapped in meat, stuffed in meat, fried in meat, and likely, dipped in meat. So true! I do like ajvar, but only the fresh kind. That, with some homemade bread = yum!